The Golden Dream Barbie is a golden-haired beauty with a beguiling look. The style and aura of this 1980 Barbie doll is simply sensational. Bright golden tones speak volumes of the immense glory and beauty of this Barbie doll. This 1980 Barbie doll flaunts a metallic gold halter jumpsuit, complete with a gold stripe over her skirt. This fabulous golden outfit defines her look, adding to this Barbie dolls appeal. Her beautiful eyes, hair and that perfect smile are what makes the Golden Dream Barbie doll even more desirable. Excellent doll, value,and beautiful . 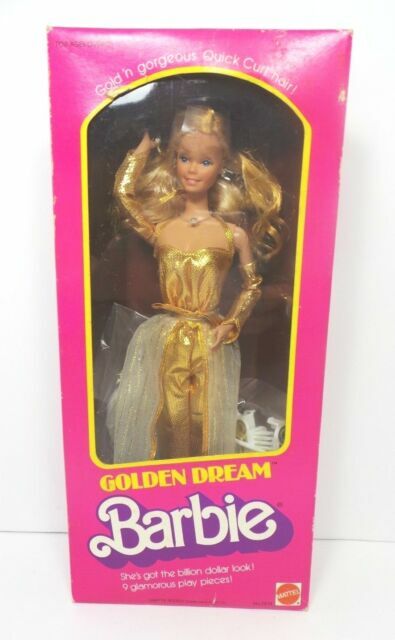 So glad to see the new Golden dream Barbie available, did a great justice to the lovely vintage doll,a beautiful collectible, Superstar Barbies are awesome additions to any serious collection. I always wanted one when I was young. Classic vintage era Barbie with hair really holds almost any style - unlike the latest versions by Mattel that only hold a curl for a few seconds, then straitens on its own. This doll is a dream doll for all Barbie Collectors! She is real vintage 80's Gold! A beautiful must have! One of the best Mattel dolls from that time! One of the best Christie dolls by Mattel ever made! Mattel doesn't make dolls like they used to! They could learn a thing or two from their past, cause there dolls of today are bunk! The doll arrived before expected and in excellent condition. Barbie Made to Move ENDLESS MOVES African American Doll Yellow Top NEW NRFB!